South Westland’s Waiho River Bailey Bridge was washed away on on 26 March. NZTA system manager Pete Connors said that it is unlikely anything could have been done to save the bridge. He pointed to the massive force of the swollen river and the huge amount of rock pounding the piers, on top of debris build-up over the course of the day. The government's emergency management group West Coast Civil Defence has been capturing images of the damage. The bridge’s river protection system had undergone maintenance and additional rock work just two weeks earlier. Connors said that claims that a temporary stopbank had directed the river channel towards the north bank are not correct. The temporary stopbank used by crews and machines to access the river’s groynes for rock wall repairs had eroded, as it was designed to do, before the flood peaked on Tuesday. 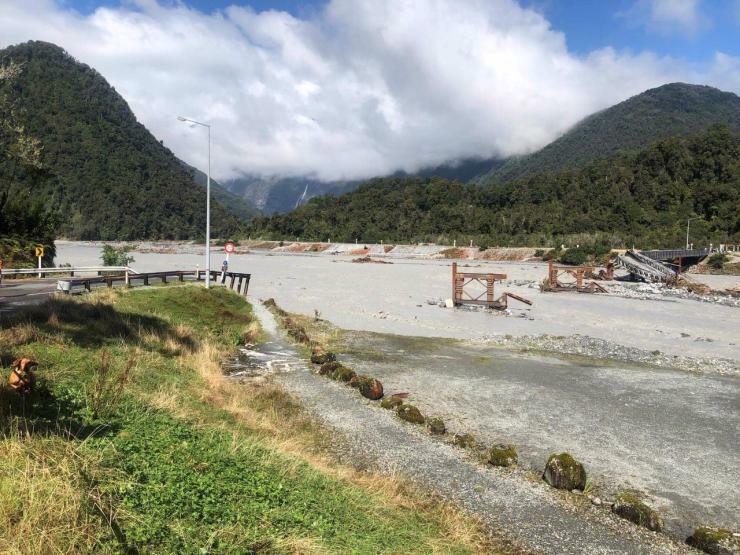 A statement from NZTA said that massive rainfall on 26 March resulted in extremely high flows in many rivers, including the Waiho which flows out of Franz Josef Glacier. The Waiho is one of the South Island’s most dynamic river systems, carrying massive amounts of boulders and rock in its water, said NZTA. In recent months the river had built up material in the centre of the channel, pushing its main channel across to the right (north) bank. When combined with the significant flood, this resulted in extremely high river velocities in the main channel, which aggressively attacked the rock groynes that protect the bridge and the rock embankment protection at the northern abutment. The scour and displacement of rock resulted in the shallow pad foundation at the northern abutment being undermined. The northernmost pier - which stands in the river - appears to have been hit by a large boulder, causing the pier to buckle and fail and resulting in the collapse of the main northern span. Once that entered the river floodwater, subsequent bridge spans were pulled downstream off their pier foundations. Two weeks ago, short periods of high water flows in the river resulted in some rock displacement. NZTA crews then repaired the bridge’s existing bunds on the north side. This is part of the regular maintenance required around this river. Once completed, the crew removed the top from the temporary rock bund that was built to access the groynes, so it would not influence where the river went later and would erode away quickly. That temporary stopbank was washed away by the time the river started to rise and push hard at the bank. 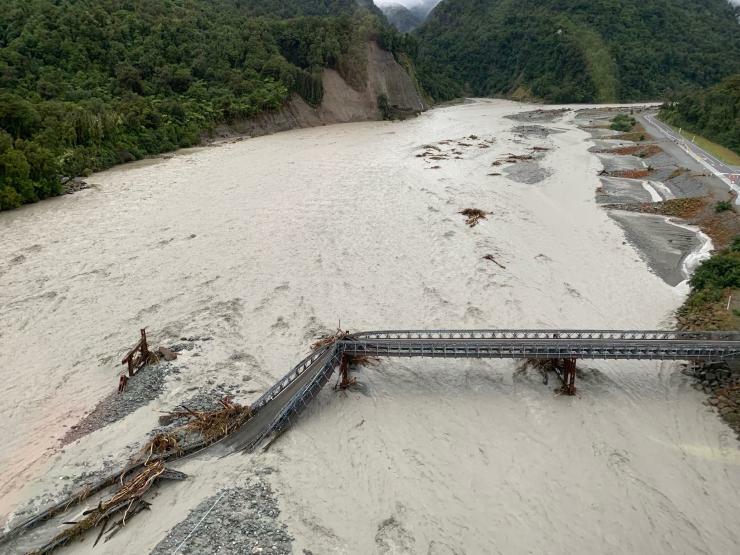 NZTA said that the river pounded the north side all day and eventually undermined the abutment, however the reason for the bridge collapsing is believed to be due to a large rock at high velocity hitting the first bridge pier. Once the pier was hit, that side of the bridge could no longer hold. The river protection works upstream of the bridge largely all remained in place, said the statement. NZTA said that it is fully committed to replacing the bailey bridge as soon as possible, aiming for seven to 10 days.